Samsung has finally launched its Galaxy M10 and M20 in India yesterday. The smartphones will go on sale from February 5th via Amazon. If you’re thinking of purchasing one of them then take a look at our specs comparison to know which one would be the right buy for you? 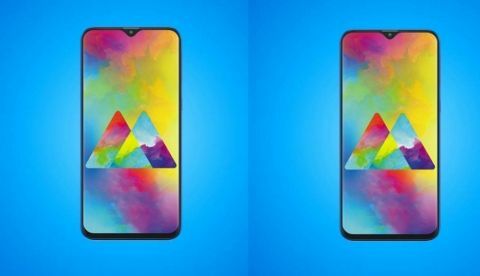 Samsung Galaxy M10 and M20 are the latest budget segment devices by Samsung, which are launched with a motive to target Millenials. The Galaxy M10 is starting from Rs 7,999 in India, while the Galaxy M20 is priced at Rs 10,990 for the base variant that will come with a 3GB/32GB storage option. Both the device has Infinity V display and dual camera setup at the back. However, there is a difference between the two that you will get to know when you go deeper. So, let’s begin with a quick specs comparison to know which device would be the right buy for you as per your requirements. Let’s begin with comparing the display of these two smartphones in detail. The Samsung Galaxy M10 sports a 6.2-inch HD+ display that offers a resolution of 720 x 1520 pixels, while the Samsung Galaxy M20 features a 6.3-inch FHD+ Infinity V display that comes with a resolution of 1080 x 2340 pixels. In terms of display, the Galaxy M20 looks a lot better than Galaxy M10 at least on paper. Coming to the processor, the Galaxy M10 is powered by an Exynos 7870 octa-core processor, which is coupled with 2GB RAM and 32GB internal memory that is expandable to up to 512GB via a microSD card. The Galaxy M10 will also available in 3GB/32GB storage model, which is priced at Rs 10,990. On the other hand, the Samsung Galaxy M20 is backed by Exynos 7885 octa-core processor, which should be faster than the 7870 in Galaxy M10. The phone is launched in 3GB/32GB and 4GB/64GB storage models. As far as the cameras are concerned, Samsung has decided to equip both the device with the same 13MP + 5MP dual rear camera along with a 13MP sensor on the front. The 5MP unit on the back can be used for capturing wide-angle shots. When it comes to the battery, the Galaxy M10 packs 3,400mAh battery that does not support fast charging. On the other side, the Galaxy M20 packs 5,000mAh battery that supports fast charging and comes with USB type-C. According to the company, within 10 minutes of fast charging the phone can provide you up to 3 hours of video playback and 11 hours of music streaming. 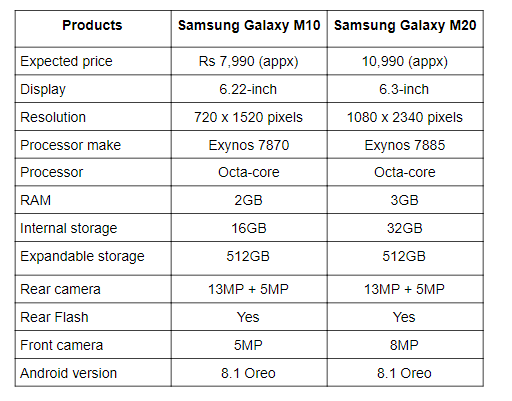 The Galaxy M10 and M20 will go on sale for the first time in India on Feb 5 via Amazon. The M10 2GB/16GB variant will be available for Rs 7,999, while its 3GB/32GB model is priced at Rs 10,999. On the other hand, if you’re interested in purchasing the Galaxy M20 then you have to spend 10,990 for the base 3GB/32GB model and Rs 12,990 to get your hand on 4GB/64GB variant of the device.